Rosenfeld, Germany – When a conveyor belt is stopped for maintenance, say in a coal mine, its own weight can create problems by distributing the tension unevenly. To ensure that a belt can be safely cut and securely spliced by service technicians, the forces in the area under repair should be spread over the whole width. For this purpose Flexco has developed the TUG HD belt clamp. It is suitable for a variety of materials and belt types – and meets rigorous industry standards. TUG HD belt clamps are used to restrain or pull a conveyor belt and then hold it firmly in place. Maintenance work becomes much simpler and safer. The user simply slides the aluminium clamp bar into the clamp ends and tightens the ends against the belt with trapezoidal screws. When the repair is finished, the screws are slowly loosened. The TUG HD applies a strong force that is evenly distributed over the entire belt width. To rule out hazards, the aluminium bars have a non-slip grip pattern that faces the belt surface. The safety factors of clamp ratings meet or exceed industry safety standards, as verified by third-party tests. The belt clamps can be used on a variety of conveyor belts – for example, PVC belts or solid woven belts. They can also be used on multiple conveyor belting types, including flat, sidewall, chevron, and other specialty profiles. Two versions are available. 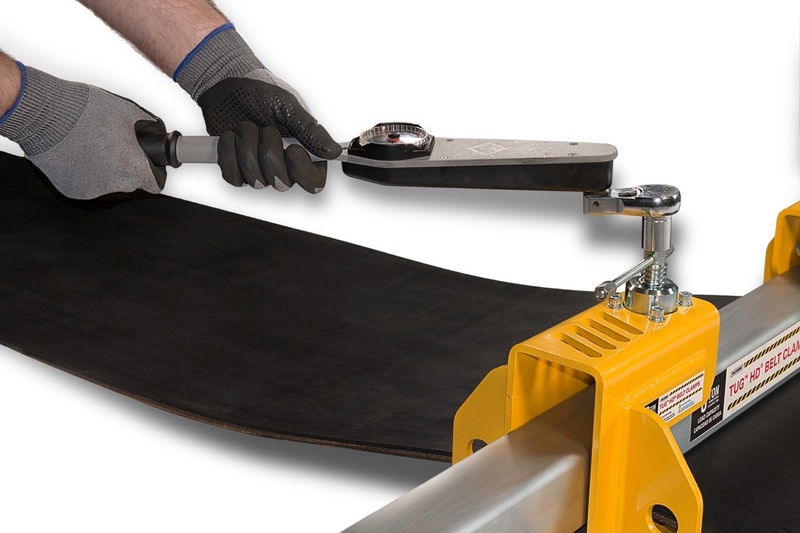 The version with a six-tonne capacity rating is suitable for belt widths up to 1,800 mm and belt thicknesses up to 50 mm. The version for eight tonnes is designed for widths up to 2,400 mm and thicknesses up to 55 mm. 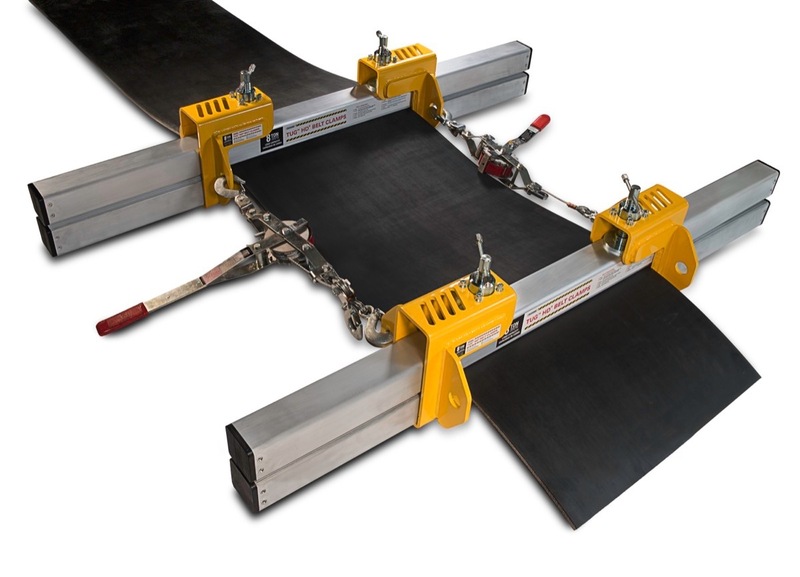 The TUG HD can be used in a dual clamp set-up at two belt sections.